The High Endoatmospheric Defense Interceptor (HEDI) is one of the many technologies being considered in the SDI technology research program and has the potential to support the requirements for the strategic defense system. The HEDI is a technology that would employ ground-based missiles to intercept and destroy hostile submarine-launched ballistic missiles and intercontinental ballistic missiles during that portion of flight that puts the target in the high endoatmosphere (the terminal portion of an attacking missile trajectory). The HEDI vehicle would consist of a two-stage launch vehicle (booster) and kill vehicle with a conventional warhead. High-acceleration missiles with precision guidance could make feasible the interception and destruction of inbound nuclear missiles, enabling point defense of hardened ground targets, such as missile silos. UPSTAGE was a maneuvering second stage interceptor developed by DARPA in the 1970s. It was later incorporated into the HEDI Program, the Strategic Defense Initiative's High Endoatmospheric Defensive Interceptor missile. UPSTAGE incorporated a ring laser gyroscope (which requires no "spin up") that had been developed partly with DARPA funding. It also used jet thrust vector control, achieving 300 g lateral acceleration. Its responsiveness made high-precision, nonnuclear kills appear feasible. High Endoatmospheric Defense Interceptor (HEDI) was a two-stage missile that operated high within the atmosphere and just beyond it. Its goal was to develop a nonnuclear interceptor capable of destroying an ICBM reentry vehicle within the Earth's atmosphere, operating at altitudes between 50,000 and 200,000 feet. The High Endoatmospheric Defense Interceptor (HEDI) used an infrared seeker in nosecone which must endure temperatures of 1,500 to 2000°F as well as high pressure. The sapphire window was cooled by flowing gaseous nitrogen. The interceptor could reach a speed of Mach 7 in 8.5 seconds. Four firms received contracts totaling $18 million for the concept definition phase of the High Endo-atmospheric Defense System (HEDS ) program. The engineering studies for this phase defined interceptor kill vehicle and critical components, viable propulsion/control design, and warhead/fuse requirements. In late FY 84, BMDSCOM redesignated the program as the High Exoatmospheric Defense Interceptor (HEDI). In October 1984 the High Endoatmospheric Defense Interceptor (HEDI) Project Office was established. The basic thrust of the HEDI effort was to assess the operational utility of HEDI in the context of a complete strategic defense system. Multiple experiments were conducted in the late 1980's and early 1990's to determine the effectiveness of transpiration and film cooling on the temperature control of an infrared (IR) seeker window during a missile's hypersonic flight. These efforts were made in support of the United States Army Space and Strategic Defense Command (USA SSDC) High-Endoatmospheric Defense Interceptor (HEDI) program. The experiments were designed as a series of complementary tests in several facilities that would provide the data necessary to predict window-cooling requirements. 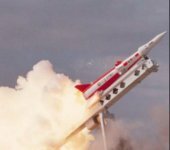 On 03 January 1986 the US Army Strategic Defense Command awarded the High Endoatmospheric Defense Interceptor (HEDI) contract to McDonnell Douglas Astronautics Corporation. The HEDI Project Office and its contractor, McDonnell Douglas Corporation, made steady progress in the program until 1989, when budget cuts forced the redirection of the contract. Several tests were, at that time, either altered or deleted from the schedule. In many respects, the HEDI project became a technology demonstration program. A total of 3 flight tests were conducted, though no intercepts were attempted. In January 1990 the Army conducted a test of the High Endoatmospheric Defense Interceptor Kinetic Integrated Technology Experiment (HEDI-KITE-1). The test was an initial examination of state-of-the-art ballistic missile defense technologies intended to provide the last layer of a defense system through the use of kinetic energy weapons to intercept missiles. The Kinetic Kill Vehicle Integrated Technology Experiment (KITE), which self-destructed prematurely, still succeeded in demonstrating the viability of "the nose cone shroud and on-board seeker window." This and other tests ultimately proved the feasibility of the shrouded sapphire window technology, cooled optics, two color seekers, advanced propellants, and other innovations. During the summer of 1990, SDIO Director Ambassador Cooper approved the Endoatmospheric/Exoatmospheric Interceptor (E2I) program as a "logical follow-on to the HEDI KITE program." At the same time, HEDI was identified as a "viable candidate for the lead ground-based interceptor for the SDS [Strategic Defense System] architecture." Using both a medium wavelength and an LWIR seeker, the E²I would expand the range of SDI's terminal defense interceptor from "tens of kilometers to hundreds of kilometers." In September 1991, the KITE-2 test again prematurely detonated, the KITE-2A flight, however proved successful. On 25 August 1992, the KITE-2A gathered data on all the required objectives, proving that "the necessary technology is in hand to perform an intercept of reentry vehicles within the earth's atmosphere using an infrared homing seeker and a non-nuclear warhead." Despite these successes, officials favored interceptors above the earth's atmosphere, and the subsequent budget constraints led to the termination of the HEDI project office at the end of fiscal year 1992.